Written by Isabella Anderson The southern area of Puntarenas, in the Costarican Pacific Coast, is one of the richest wildlife zones in Central America and the Pan American Pacific, and it’s ideal for tourists looking for the ultimate Costa Ricaeco tour. Extending between the Osa Peninsula and the border with Panama, it is home to the famousCorcovado National Park, a huge tropical rain forest which has been defined as one of the most biologically active areas in the world and it’s one of the favorite touristic attractions in Costa Rica. Corcovado is the natural habitat of many wildlife species living in large populations that need ample space free of human activity. The South of Puntarenas has many touristic spots spread in several zones, including marine parks and protected areas, small towns and beautiful beaches with great surfing activity. The Costa Ballena are being formed by beaches such as Dominical, Dominicalito, Hermosa, Uvita, Arco, Ballena, Pinuelas, Ventanas and Tortuga. The Pacific Ocean beaches are very well-known for their ideal conditions for Costa Rica surfing trips, kayaking, scuba diving, sports fishing, canopy, diving, horse back riding and others. With all these activities, the South of Puntarenas is ideal for Costa Rica group tours. Other important touristic landmarks are Puerto Jimenez, Ojochal, the Marino Ballena National Park and Pavones. Marino Ballena is one of the greatest Costa Rica eco tours, and you will be able to watch the massive whale migration that happens every year in front of the coast, along with other species like dolphins and turtles. Costa Rica tour operators offer whale watching tours, and the mangroves in Ojochal, near Ballena, provide a perfect chance for Costa Rica birding tours. In Southern Puntarenas, you will also find important archeological sites with pre-columbian stones, Nauyaca waterfalls 6 miles from Costa Ballena, and the Hacienda Barú Wildlife Refuge with long, secluded beaches. There are many Costa Rica hotels in the Southern Puntarenas area, ranging from cheap Costa Rica hotels to Costa Rica luxury resorts. To get to this part of the Pacific, you can drive over the Costanera Highway from San Jose, go past Quepos for one hour and enter Dominical; or take a 45-minute flight to any of the local airports. 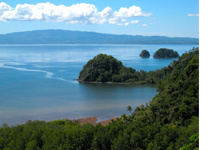 The weather in South Puntarenas is warm and humid during all year, with heavy rains in the rainy season (May to mid-December).